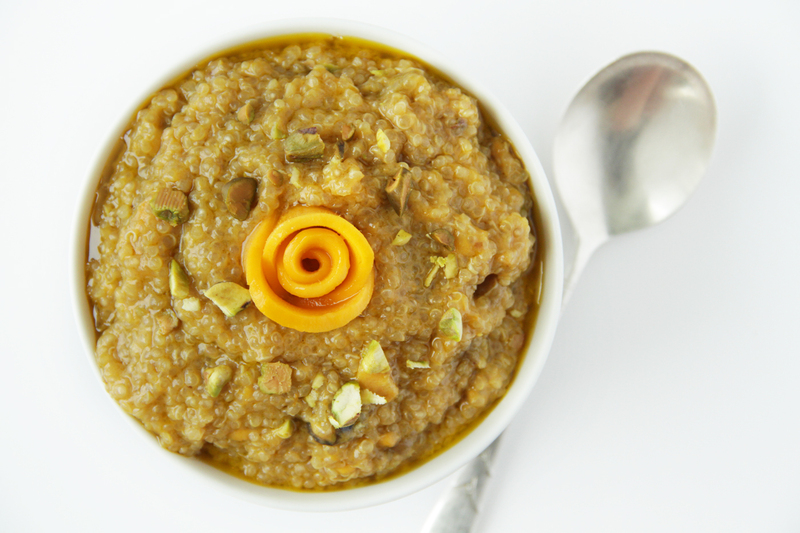 Kheer is an Indian dessert, similar to rice pudding, that both Nikki and I happen to love! 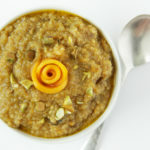 Traditionally it’s made with rice that is cooked in milk that’s flavoured with cardamon and saffron. It’s creamy, rich and a delight for the taste buds – however it’s a special treat. So here’s the deal… I made this with lighter ingredients using quinoa and coconut milk, kept the traditional spices, topped it with mango and it turned out amazing! The awesome news is that it’s nutritious & healthy – and can be enjoyed as a breakfast or mid day snack. Quinoa is naturally gluten-free and contains iron, B-vitamins, magnesium, phosphorus, potassium, calcium, vitamin E, and fiber. It is one of only a few plant foods that are considered a complete protein, containing all nine essential amino acids making it an excellent choice for vegans who may struggle to get enough protein in their diets. Amino acids are used by the body as building blocks for the development of muscle tissue and necessary metabolic enzymes. Quinoa is high in anti-inflammatory phytonutrients, which make it potentially beneficial for human health in the prevention and treatment of disease. It also contains small amounts of the heart healthy omega-3 fatty acids and, in comparison to common cereal grasses has a higher content of monounsaturated fat. One cup of mangoes has 100 calories. The same amount provides 100% of your daily vitamin C recommendation for promoting healthy immune function and collagen formation, and 35% of your vitamin A, important for vision, bone growth, and maintaining healthy mucous membranes and skin – plus, it’s shown by clinical studies to help protect your body from lung and mouth cancers. Fresh mango is a good source of potassium. Potassium is an important component of cell and body fluids that helps controlling heart rate and blood pressure. Mangoes play a prominent role in eliminating problems such as indigestion and excess acidity. The digestive enzymes in mangoes help to promote natural, efficient digestion. Perhaps you might be surprised to know that mangoes are closely related to skin health. Other than bringing a healthy glow to your face, they also help to lighten skin color. You can easily enhance your health and beauty by including this tasty fruit in your diet on a regular basis. Healthy breakfast variation of an Indian pudding. 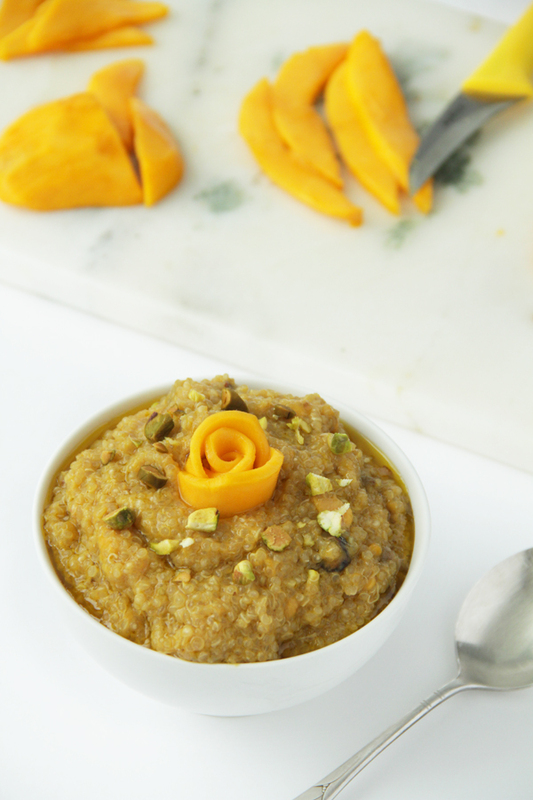 Quinoa Mango Kheer doesn't require any special cooking skills as it is simple and easy to make - plus it can be made in just few minutes. Wash the quinoa well under running water. Now pour the coconut milk into a large pot. Cook on low heat for 10-15 minutes, stirring occasionally. Lower temperature and check if the quinoa is soft. Stir in raisins, pistachios, cardamom and saffron (discard the soaking water). Cook for another 5-7 minutes, stirring constantly. Remove from heat, transfer into a large bowl and allow to cool. Meanwhile, peel the mango, discard the pit and coarsely chopped the fruit. Put the mango into a high speed blender or food processor and process for 30 seconds to make a smooth puree. Mix the mango mixture into the quinoa. Divide the mixture into two bowls and sprinkle fresh diced mango and shredded coconut. We hope you like this sweet treat.